By George Monbiot. Published October 2013 by Allen Lane, Penguin Press. How many of us sometimes feel that we are scratching at the walls of this life, seeking to find our way into a wider space beyond? That our mild, polite existence seems to crush the breath out of us? 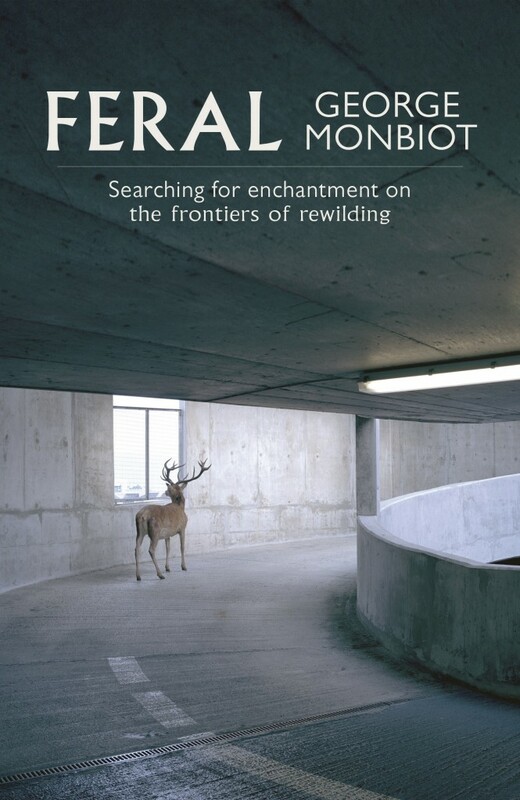 Feral is the lyrical and gripping story of George Monbiot’s efforts to re-engage with nature and discover a new way of living. He shows how, by restoring and rewilding our damaged ecosystems on land and at sea, we can bring wonder back into our lives. Making use of some remarkable scientific discoveries, Feral lays out a new, positive environmentalism, in which nature is allowed to find its own way. From the seas of north Wales, where he kayaks among feeding frenzies of dolphins and seabirds, to the forests of Eastern Europe, where lynx stalk and packs of wolves roam, George Monbiot shows how rewilding could repair the living planet, creating ecosystems in post-industrial nations as profuse and captivating as any around the world. Already, large wild animals are beginning to spread back across Europe, and fin whales, humpback whales and bluefin tuna are returning to the seas around Britain. Feral is a work of hope and of revelation; a wild and bewitching adventure that argues for a mass restoration of the natural world – and a powerful call for us to reclaim our own place in it. Published by Allen Lane, and now in paperback (as Feral: rewilding the land, sea and human life) by Penguin. “Whether you agree with Monbiot’s position on the environment or not, you can hardly fail to be impressed – and moved – by the wonderfully specific way he writes of his own personal experiences of it. His is a world of orange nematocysts, jellyfish “like burst figs”, gannets, river mouths, creeks, mudflats, ochre and viridian lands. One of the things you really notice about the “new wave” of nature writing, evinced also by writers like Robert Macfarlane, is how the words sound. This is prose style as auditory experience; what majesty the eye notes in the landscape is echoed in the vocabulary. Is there a “wildness” in this kind of writing, too? Monbiot’s personal experience is impressive – this is a man who likes action, who works with tribesmen, goes down rapids, chases over moors. He uses it to explain his views: he knows not everyone likes the idea of wolves released into the wild, and sets up his stall, explaining that they’re more afraid of us than we are of them, how they will re-inscribe the landscape. If we expect other countries to preserve dangerous animals in the wild, shouldn’t we at least be prepared to do the same? “He’s a proper reporting journalist, he can write, and he stands for something — which puts him, these days, well ahead of most of our tribe. Plus, this peculiar and involving book — three-quarters exhilarating environmental manifesto, one quarter midlife crisis — has an enormous amount to recommend it … extraordinarily good and crunchy material … There’s a lot here to digest and think about, much to be excited by”. “Feral has really opened my mind to the history and possibilities of our landscape. “Given that man has already reshaped the surface of the planet several times over, Monbiot has the intellectual temerity to suggest how we might do it better from here on in. And he throws down the gauntlet with great panache. As a species, he argues, we’ve made enough calamitous mistakes to learn from, and gathered enough experience and evidence down the ages to draw a new and challenging conclusion: huge swathes of wild places, on land and sea, teeming with life that is largely outside our influence, are necessary not just for the diversity of life on earth, but for the spiritual nourishment, perhaps even the social stability, of mankind. And we can create such magical, life-affirming places with a radical new environmental management plan: leaving them alone. ← What’s Missing from this Picture?